When you book your meeting online for up to 24 persons with our day package we offer free morning coffee for all participants (value SEK 125 pp). LET US MAKE YOUR BUSINESS OUR BUSINESS. Time for a conference? We have 14 conference rooms with capacity for anything from 1 to over 150 participants, and all rooms come with state-of-the-art technology and available staff for your convenience. Located in the city-centre with the central station and Arlanda Express next door, we are easy to find. Welcome with your reservation. coordinators are available Monday–Friday 8.30 am–5 pm. A flexible room for 8-11 people. If you’re 8 you can have your own tables, island seating or u-shaped seating. A flexible room centrally placed in our Light Meetings conference area. It’s perfect for up to 63 conference participants. Flexible and comfortable conference room for up to 24 people. Another one of three cylinder-shaped conference rooms with glass walls. Let the light in or shut the drapes – anyway you like it. A light and spacious corner room with windows in two directions. Windows can be covered and overall lights can be changed. A flexible, light and peaceful conference room with capacity for up to 36 people. This is an inviting conference room that can comfortably fit up to 54 people. A flexible and comfortable conference room for larger groups. This flexible conference room is located right by the Light Meeting entrance and has space for up to 50 people. One of three cylinder-shaped conference rooms. The glass walls can be the perfect creative space but there are also drapes to shut for privacy when wanted. The larger one of three cylinder shaped glass rooms. Drapes to shut whenever you’re in need of more privacy. Bright and light room to sharpen ideas and let creativity flow. The perfect room for focus and creativity. In need of a workshop perhaps? This is the spot. 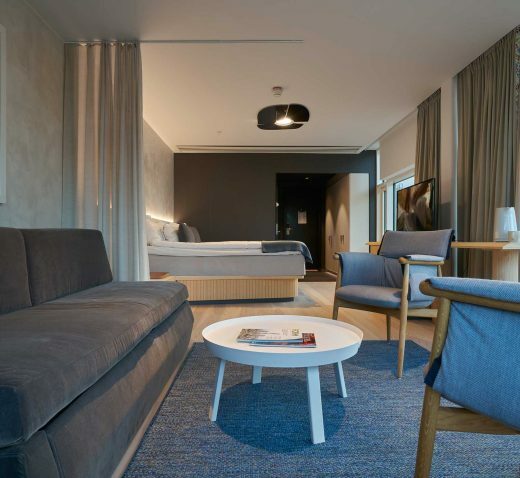 Light Meetings is an original and stylish business venue at Nordic Light Hotel, located only steps from the Central Station and the airport express. All meals are served by Lykke & Löjromsbaren, our in-house restaurant with a strong personality and a true passion for food, wine and people. When you book a meeting with us, you can rest assured that we’ll make everything as easy as possible for you. Our technology is cutting-edge, but it’s always simple to use.You can easily customize your space by changing the light and color to set a mood – pick red for energy and blue for stillness. Our friendly, professional business hosts are present and make sure everything runs smoothly behind the scenes. Meals, meal package / dinner? By filling in your information to make a request, you agree that we will save certain personal information in line with GDPR. Read more about our terms. We also think long relationships are to be rewarded. So we have launched the Stay more – save more deal, which offers you a 15-20 % discount when you book a minimum of 4 nights with us.